Online gaming software provider SBTech are launching a new online gaming brand that will be fully licensed in the UK. The firm has partnered five-time World Heavyweight Champion boxer Evander Holyfield as the brand is themed on the champion boxer's nickname, 'The Real Deal'. Designed and developed by SBTech, which is regarded as one of the best platforms in the industry, Real Deal Bet will be an amazing sports betting site, but will also feature tons of interactive casino style games, powered by leading casino games providers such as Netent, Microgaming, Betsoft and many more. The new site will offer markets for UK, European and worldwide sports events including a range of unique live bet types. It will cover more than 60,000 events per month, with more than 30 sports, including 150 football leagues. Bettors will also enjoy over 200 in-play bet types on 4,500+ live events every week. Furthermore, RealDealBet.com is said to be offering more than 1,000 casino titles, ranging from baccarat and roulette to online pokies and video poker, from classic card and table games to the best online video slots. Punters and casino gamblers will be able to access RealDealBet.com via any mobile device thanks to SBTech's HTML5-based touch screen optimized software. RealDealBet ambassador Evander Holyfield featured at the industry-leading company's presentation at ICE Totally Gaming 2015, Feb 3-5 at the ExCeL London Exhibition and Convention Center, as part of the SBTech Stadium experience. Holyfield is the only 5-time World Heavyweight Champion, winning the WBA, WBC, and IBF titles in 1990, the WBA and IBF titles in 1993, and the WBA title in 1996 and 2000. "We're thrilled to partner with Evander and build a successful cooperation on the launch of RealDealBet.com. He's an inspirational individual, not to mention a champion many times over, and we're confident as experienced industry frontrunners that we can achieve the same levels of success for this new endeavour.” said Itai Zak, CEO of SBtech. 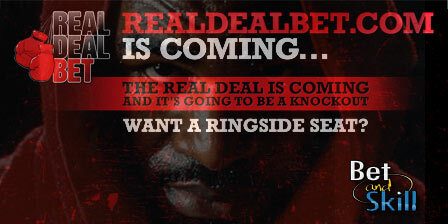 Do you want a ringside seat to the legendary Evander Holyfield's Real Deal Bet online sports betting site? STAY TUNED! RealDealBet €5 no deposit bonus - Start betting without deposit! "New Bookmaker RealDealBet to be launched soon by SBTech"